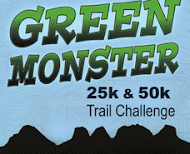 Prior to a last minute decision to run the Pine Creek 100k (race report) on September 10th, I had set my eyes on the new Worlds End Fall Classic (Oct 1) and Green Monster Trail Challenge 50k (Oct 9) as a two-weekend block of tough goal races to close out my mountain racing season. But having thrown a 100k into the mix, things changed and got a little weird. First was the obligatory recovery period, next a nasty case of the post race blues (article) and the loss of motivation. Before I knew it, 20 days had passed, with only a pair of embarrassingly short training runs to show for it. The two races I was most looking forward to this autumn now seemed somehow 'smaller' in the slowly fading afterglow of my second 62 miler. And how would my body respond to the downtime? One of the great things about trail running is the unfailing capacity of a start/finish line to sort out any problems or doubts you might have. All that it asks is you step across it. 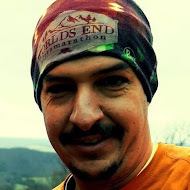 The World's End Fall Classic begins just as the World's End Ultramarathon does.... pass under the banner at cliff-side pavilion, down the path, and then a hard left onto asphalt, up the hill past the park office, and across the bridge. 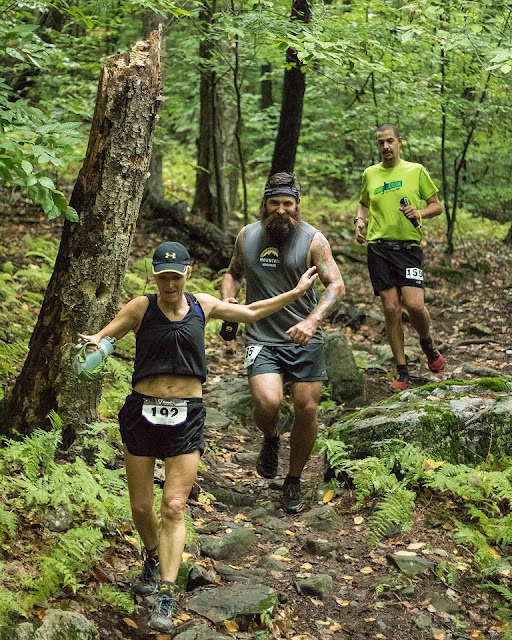 But rather than hitting Butter Nut Trail (video), the course takes another hard left up High Rock Trail (video), and instead of continuing on up the mountain along the Loyalsock Trail (video) takes a right and careens down the scree and boulders of Butternut Trail opposite the typical direction. Once you hit the bottom the course retraces its steps across the bridge and up the asphalt to the park office. A couple of orange road cones direct you into the yard behind the office onto a trail (The Link Trail) that threads itself along the narrow banks of the Loyalsock Creek. If you've run the 50k you will have seen this trail in the opposite direction sometime around the 20 mile mark. Much as it was this past May, recent rains rendered this section a bit slippery. After a short time the trail leaves the creek side, crossing Route 154 onto Double Run Nature Trail to begin weaving its away up the mountain. Prior to the race we were warned of a tricky intersection here (to be revisited later in the day). The spot was marked well with orange cones and tape to prevent runners from taking the wrong direction. We made it through without any navigational errors, to begin a short but tricky climb up moss covered boulders (one of my favorite spots on the course). We soon found ourselves rolling downhill again (Canyon Vista Trail) into the first aid station - 5 and a half miles into the course. Beyond the first aid station the next climb begins almost immediately, an arrow straight stretch of single track rising gradually along the mountain's face, eventually turning into a more traditional, steep, central PA grind. The course description says "Once you’re headed up the mountainside, buckle down and hold the cursing to a minimum," and under other circumstances it might have been needed advice. Today, however, a good steady conversation kept our little trio moving along in rhythm, and me oblivious to whatever pain I should have been feeling. Once up and over the top, we approached the Rock Garden (video) from the back side. The Rock Garden boulder formation is little more than a few dozen yards from the Canyon Vista overlook (and second aid station), but as something of a cruel joke, course markings instead lead us away from the view along some all too runnable, gradually descending trail, before at last bringing us back up to Canyon Vista via a dirt road. Tracy dropped us on the gradual gradient and that was the last we'd see of her until the finish. The view from Canyon Vista alone is worth the price of admission, but we stayed only long enough to refill on fluids before moving along. The next section of course features significant downhills that lead back to the tricky two way intersection in Double Run we'd seen earlier. By this point I was feeling like it was time to be done, but rather than continuing on down back to Route 154. we hung a left and threaded or way, over slippery rocks and grabbing roots, along the east branch of Double Run. The gradual climb is worth it however, as it sets up the crushing descent back down Pioneer Road and the Loyalsock Trail into the park and the finish. Josh dropped me on the downhill, and I cruised back into race HQ, solo for the last quarter mile or so, in 3:17. Of course no PA TRAIL RACE is complete without good food and great local craft beer.